The Archos GamePad was an interesting introduction in to the world of Android game consoles by Archos. While it had a mixed response, it was definitely a step in the right direction. So learning from their past experience, Archos have just announced the GamePad 2. The GamePad2 is packed with an IPS HD screen, a faster Quad Core processor, and the propriety Archos Game Mapping Tool. The GamePad 2 also packs complete versions of Asphalt 8: Airborne and Modern Combat 4: Zero Hour by Gameloft both revisited for physical controls. The Archos GamePad 2 offers a 7″ IPS HD screen which is perfect for gaming. The wide screen has a 1280 x 800 resolution, that is perfectly designed for gaming as well as multimedia. It offers vibrant colours, and looks great from all viewing angles. With an upgraded processor, and a larger battery, not only does this run faster, but it can also process the latest games faster. The improved battery life also means that you have enough power to last you gaming, browsing, and any other work you may want to do. The ARCHOS GamePad 2 features more precise, incurved dual thumb-sticks, double buttons on each shoulder, a single part directional pad and a vastly improved button click-feeling for a better physical gaming experience. Combined with the updated version of the critically praised Game Mapping Tool, first featured on the GamePad 1, that lets users map any touch-screen button game to work with the physical controls, theARCHOS GamePad 2 offers an improved android gaming experience for hundreds of thousands of free and paid games. Archos GamePad2 also packs in the GameZone app which allows you to find games specially tuned for this tablet. The ARCHOS GamePad2 will be available at the end of October at €179.99 on www.ARCHOS.com. 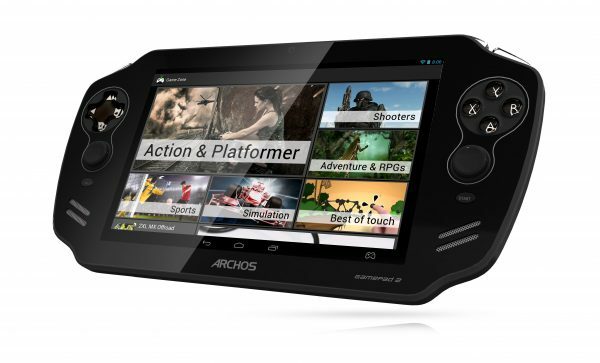 For more information about the GamePad 2 or other ARCHOS products visit www.ARCHOS.com.